That’s what parallel parking seems like at times. Trying to fit your car into a parallel parking space is the unopposed champion of driving nightmares for drivers young and old. It seems the parallel parking dimensions shrink just as you begin to point your car into the space. To master the art of parallel parking, you first need to know the dimensions of the car that you want to fit into the parking space. Look in your owner’s manual or physically measure the length and width of your car. With this info in hand, you’ll know whether you can fit in a custom “compact car” space or if you’ll require a standard parallel space. Parallel parking dimensions vary from state to state, and sometimes even city to city. Most parallel parking spaces will have a standard length of 22 feet to 26 feet. The width of the space is usually around 8 feet. Spaces designated for compact cars will have smaller dimensions, more in the 20 feet length and 7 feet width. The only way to master the art of parallel parking is to practice. Trying to fit a car into the parallel parking dimensions usually found is intimidating but not as impossible as it seems. Many new drivers today don’t concern themselves with learning to parallel park because many states no longer require it as part of their driving test. Not surprisingly, this resulted in an increase in the first-time passing rate for those taking the state’s driving test. 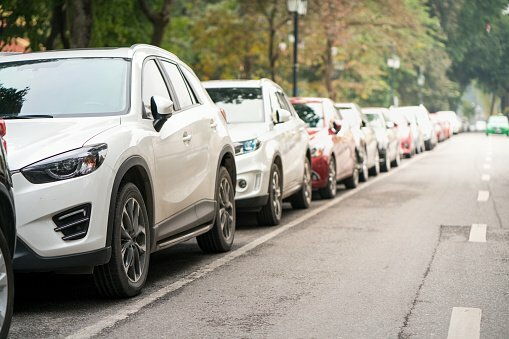 In 2015, for example, a year after it eliminated the parallel parking requirement, Maryland saw an increase in their driver passing rate to 68.5 percent. That was up from the average of 48.8 percent to 56.1 percent over the previous five years. However, in real life you’ll soon find that parallel parking is a skill you need. Parallel parking really isn’t the monster it seems. Don’t let the parallel parking dimensions scare you; all you have to do is follow the instructions. With a bit of practice, you’ll be slipping your ride into parallel parking places like a boss in no time. Pull up until you’re even with the car in front of your parking space. Turn on your blinker so cars behind you know what you’re about to do. While you’re stopped, turn your steering wheel all the way to the right. Don’t move while you’re doing this. Turn around in your seat until you can see out the back of your car. Your car should be turning into the parking space. Keep your steering wheel all the way to the right! When you see the passenger-side corner of the rear car in the middle of your rear windshield, stop. While you’re stopped, turn your steering wheel back to the middle position. Continue slowly backing up, until your car clears the car in front. Turn your steering wheel all the way to the left while you’re stopped. Continue backing into the space. Keep your wheel all the way to the left. When your car is parallel, stop. Turn your steering wheel to the middle again. Move forward a bit if needed to center your car in the space. Voila! You are now successfully parallel parked. You may now proceed with your day.